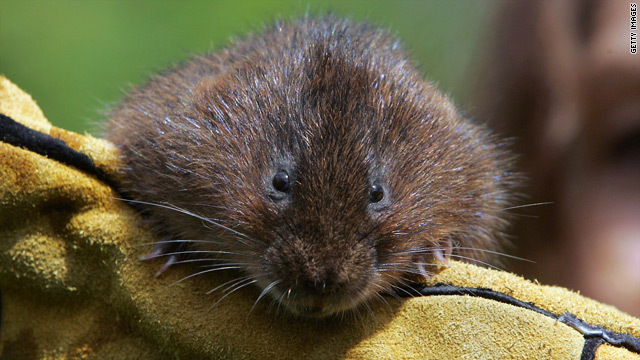 Vole populations in North America fell permanently in the last period of global warming, 12,000 years ago. (CNN) -- The biodiversity of small mammals in North America may already be close to a "tipping point" causing impacts "up and down the food chain" according to a new study by U.S. scientists. Examining fossils excavated from a cave in Northern California, biologists from Stanford University, California uncovered evidence that small mammal populations were severely depleted during the last episode of global warming around 12,000 years ago. Many species, say researchers, have never recovered their populations leaving them vulnerable to future rises in temperature. Deposits in Samwell Cave in the foothills of the southern Cascades mountain range revealed that populations of gophers and voles during the period (the end of the Pleistocene epoch) were on a par with those of deer mice. But while the deer mice population thrived in the warming period and has become one of the most common small mammals in the U.S. today, gophers, voles and other small species' populations fell away permanently. The decline in small mammal species during the period contributed to a 30 percent decline in biodiversity, according to the study. Co-author and professor of biology at Stanford University, Elizabeth Hadly says deer mice are considered a "weedy" species and when they replace other small mammal species, the effects ripple through the ecosystem. Lead author of the study, Jessica Blois says because they are so common, it's easy to take small mammals for granted. But they play important ecosystem roles "in soil aeration and seed dispersal and as prey for larger animals." Unlike some larger animals -- mammoths, mastodons and dire wolves -- small mammals never became extinct during the Pleistocene epoch. But despite their resilience, Blois says small animal species face an uncertain future. "Even though all of the species survived, small mammal communities as a whole lost a substantial amount of diversity, which may make them less resilient to future change," she said in a statement. The research, which was recently published in the science journal, Nature, underlines the effects climate change could have on all types of biodiversity, not just the "eye-catching species." "The temperature change over the next hundred years is expected to be greater than the temperature that most of the mammals that are on the landscape have yet witnessed as a species," Hadly said in a statement. "The small-mammal community that we have is really resilient, but it is headed toward a perturbation that is bigger than anything it has seen in the last million years." she added. The third edition of the U.N.'s Global Biodiversity Outlook (GBO-3) recently stated biodiversity loss is rising at an unprecedented rate and urged governments to take immediate action to avoid "catastrophic tipping points." Jane Smart, director of IUCN Biodiversity Conservation Group said in a statement: "There's been overwhelming support in Nairobi for 20 strong, ambitious but realistic targets for the next 10 years, designed to prevent the extinction crisis and restore Earth's ecosystems."